Life is a fight for glory. No one understands this more than Muhammad Ali. If you're looking for a dorm room decorating idea that will inspire you, motivate you, and make you feel like you can be a champion too, add this dorm safe, dorm size Muhammad Ali Door Poster to your college decorating stuff. 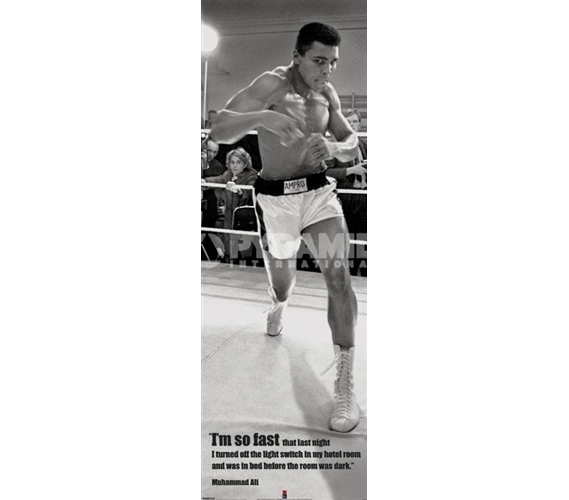 This Muhammad Ali Door Poster fits right on your dorm door, and is a great college decorating accessory. Cheap dorm posters are easy to find on dormco.com. You can always get away with a college poster on your dorm wall. They're light, easy to hang, and dont' break the dorm room rules. This Muhammad Ali Door Poster is shaped to fit on your dorm room door too, so every corner of your dorm room can be decorated.